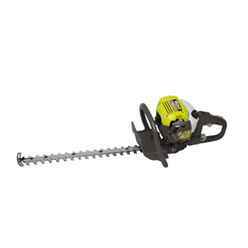 Ryobi 26cc Petrol 60cm double sided blade Hedgecutter with Easy Start™ System for easy starting. The Easy Start™ carburettor allows easy starting, whilst the powerful 26cc engine has hard chrome plated cylinder for more durability and a heavy duty clutch for optimum power transfer. A 5 position rotating back handle gives added user comfort.It has a 28mm cutting capacity from the 60cm double sided, dual reciprocating blade and a front blade guard.